HOT SULPHUR SPRINGS – The victim of the shooting just before midnight Monday at the former Riverside Hotel is a 31 year-old male not from Grand County, according to Grand County Coroner Brenda Bock, who is awaiting contact with family members before releasing more information. Bock confirmed the man died of gun-shot wounds, but has yet to examine the body, she said. Shortly before midnight on April 1, Grand County Deputy District Attorney Heather Stein of the 14th Judicial District placed a 911 call to the Grand County Sheriff’s Office reporting a stranger at her front door at the Riverside property. The man was behaving erratically and causing a disturbance, according to a press release from the Colorado Bureau of Investigation. The investigation revealed, the press release states, that the intruder pushed his way into the house and an altercation ensued. It is believed that shots were fired during this altercation outside the Stein residence in the 500 block of Grand Avenue in Hot Sulphur Springs. Stein’s husband is Grand County Sheriff’s Lt. John Stein. Both the deputy DA and the Sheriff’s deputy suffered minor injuries during the violent altercation with the man, according to the Colorado Bureau of Investigation. Because the incident involves a deputy DA and a Sheriff’s deputy from Grand County, 14th Judicial District Attorney Brett Barkey has requested assistance from the Colorado Bureau of Investigation and the 1st Judicial District Attorney’s Office of Jefferson and Gilpin counties. The CBI is leading the investigation. 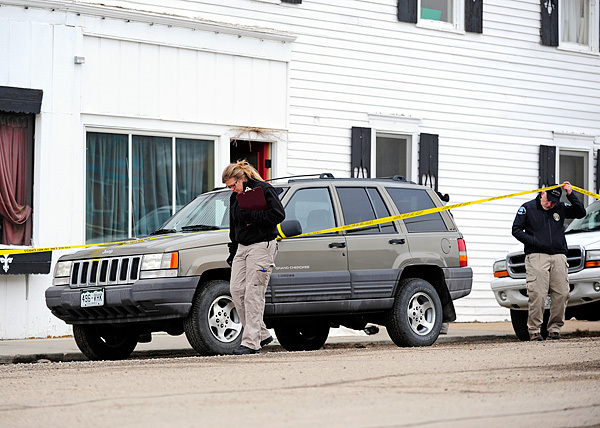 The Critical Incident Team for Moffat, Grand and Routt counties is assisting in the investigation. Both the deputy DA and the sheriff’s deputy have been put on administrative leave pending the outcome of the investigation. A neighbor to the Riverside Hotel, Tim Nicklas, who lives at the corner of Grand Avenue and Aspen Street, corroborated with another witness he heard three consecutive gun shots, and when he went to the scene, already officers were questioning John Stein. Nicklas overheard Stein tell them, “The family’s fine, the kids are OK.” The Steins have four children living in the home. The former Riverside Hotel is a five bedroom, four bathroom two-story building on Grand Avenue built in 1910. The couple is renovating the building to make it a single-family home.